Day 1 - We meet at our dedicated Departure Office at St Pancras International, then take the Eurostar to Paris in Standard Premier Class, with a complimentary meal and drinks served on board. On arrival we transfer to our hotel for two nights, the 5-Star Starhotels Castille. Dinner is included tonight in a local restaurant; afterwards why not take a stroll down the magnificent Champs Elysées? Day 2 - We begin the day with a guided tour of Paris by coach and on foot, which takes in this captivating city's most famous sights. We see the Louvre and the Arc de Triomphe, the magnificent monument completed in 1836 to commemorate victories by France's armies. This afternoon is free for you to explore independently. Perhaps take a trip up the city's most famous monument, the Eiffel Tower. From the top of its 320 metre spire, enjoy glorious views of the city sprawled below. An elevator is used to ascend to the summit, but if you're feeling adventurous, you can climb two-thirds of the way up. For a more leisurely afternoon, pay a visit to the Jardin du Luxembourg, a stunning collection of gardens dedicated to the children of Paris by none other than Napoléon. With 23 hectares to explore, these treasured gardens boast apple orchards to the south, with lemon and orange trees sprouting behind the Musée du Luxembourg, which overlooks the park. Day 3 - From Paris we travel on the high-speed TGV, heading southeast towards the mighty Alps. We cross the border into Italy, passing through Turin on our way to Milan, Italy's fast-paced and fashionable economic capital. On arrival we transfer to our hotel, the NH President Collection, for a two night stay. After dinner take a leisurely stroll through the city or perhaps sit at a pavement café with a cappuccino and watch Milan come alive as darkness envelops this lively city. Day 4 - Milan is well-known as one of the fashion capitals of Europe, but it also offers its visitors plenty in the way of history and culture. We begin our time in Milan with a guided tour, by coach and on foot, including a visit to the incredible Duomo - the largest Gothic cathedral in the world. We visit the world's most famous opera house, the 'Teatro alla Scala', and the beautiful 19th century glass-roofed shopping arcade, the 'Galleria Vittorio Emanuele.' Your afternoon and evening are free to explore. One option is to visit the Museo del Novecento, overlooking the Piazza del Duomo. Once Mussolini's Arengario, the building now houses a fine collection of 20th century art, including works by Umberto Boccioni, Campigli, de Chirico and Marinetti. Day 5 - Sit back and enjoy our First Class train journey to Venice, the floating city of shimmering waterways, elaborate bridges and ornate palaces. Arriving at the city's Santa Lucia station we are greeted by a truly glorious view of the shimmering Grand Canal, before we transfer to our hotel, the Hotel Splendid Venice. Your afternoon is free to relax and begin your exploration of Venice. This wonderful city is steeped in rich history and offers spectacular sights from almost every aspect. Allow yourself to get lost among the winding lanes and twisting alleyways of this incredible city or take to the water to view Venice from a different perspective.Today we enjoy a guided tour of Venice, including the magnificent St Mark's Square, undoubtedly one of the most beautiful city squares in the world. Overlooked by St Mark's Basilica, the large open space is surrounded by the Doge's Palace, the Procurator's residence, the famous Sansoviniana Bookshop and the iconic bell tower, as well as the waters of the lagoon. Our local guide takes us on a walking tour of the city, leading us around the narrow streets and small squares to visit some of Venice's main sights, the famous Rialto Bridge, completed in 1591 and an architectural gem that spans the Grand Canal. You are free to spend the afternoon soaking up more unforgettable sights. One of the best ways of seeing the city is to travel along the entire length of the Grand Canal by boat, as many of Venice's finest buildings line its banks. Take an enchanting gondola ride on the canals, or explore using Venice's water-bound public transport network - the Vaporetti. This unique form of public transport is an affordable way to see the city from its glorious waterways. Tonight we dine in a local restaurant. Day 6 - Today we enjoy a guided tour of Venice, including the magnificent St Mark's Square, undoubtedly one of the most beautiful city squares in the world. Overlooked by St Mark's Basilica, the large open space is surrounded by the Doge's Palace, the Procurator's residence, the famous Sansoviniana Bookshop and the iconic bell tower, as well as the waters of the lagoon. Our local guide takes us on a walking tour of the city, leading us around the narrow streets and small squares to visit some of Venice's main sights, the famous Rialto Bridge, completed in 1591 and an architectural gem that spans the Grand Canal. You are free to spend the afternoon soaking up more unforgettable sights. One of the best ways of seeing the city is to travel along the entire length of the Grand Canal by boat, as many of Venice's finest buildings line its banks. Take an enchanting gondola ride on the canals, or explore using Venice's water-bound public transport network - the Vaporetti. This unique form of public transport is an affordable way to see the city from its glorious waterways. Tonight we dine in a local restaurant. 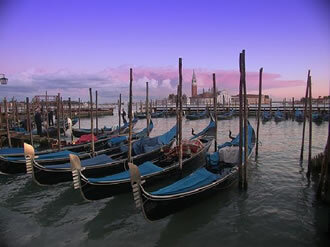 Day 7 - Today gives you the opportunity to further explore Venice. Perhaps visit the nearby island of Burano, famous for its lace-making and full of colourful streets lined with pastel-painted houses, or the island of Murano, which is renowned for its gorgeous glassware. Explore Murano's sparkling art history at the Museo del Vetro, which houses some of the best examples of locally-produced glass artworks. With Roman pieces dating back 1500 years, to 17th century works adorned with delicate gilt work, to modern-day pieces and an explanation of the glass-making process available in an adjoining salon, this is the best way to experience Murano's greatest claim to fame. Day 8 - This morning we join the world-famous Venice Simplon-Orient-Express. After your steward settles you into your comfortable private vintage cabin, all you need to do is relax and watch the stunning scenery unfold before enjoying lunch as we pass through the magnificent Italian Dolomites with tea and pastries served as the train travels through picturesque Austria. Then it's soon time to dress for dinner in one of the stunning three restaurant cars. Afterwards, why not linger over a nightcap listening to the sound of the baby grand piano? Retire to your cabin when you're ready, which has now been transformed into a cosy bedroom. Day 9 - A continental breakfast is served in your cabin today as we pull into Paris. From here we transfer to Paris Nord to catch our onward Eurostar to London. Please Note - While every departure of this tour will feature the same excursions, the order may differ from that shown above. Single Rooms available for a supplement. The 4-Star NH President Collection in Milan boasts a fantastic location, close to the capital's bustling fashion district. Set within easy walking distance of iconic attractions, including the Piazza del Duomo and the 18th-century theatre, Teatro alla Scala, as well as the vibrant Galleria Vittorio Emanuele II shopping promenade, allowing ample options for souvenirs. The hotel's restaurant serves regional Milanese, broader Italian and international cuisine, whilst the on-site bar offers a range of cocktails, including local specialty drinks. Each room features air-conditioning, a flat-scren television, a minibar and a bathroom with a rain shower. To book this offer, or for more information, just call us on 0800 849 1285, quoting reference number 232754.